Embossed textures. Deep colors. Printed, translucent vellums, and unique, colorful assortments. And that?s just for starters! The papers in our Creative Collection are designed to inspire crafters, scrapbookers and artists. 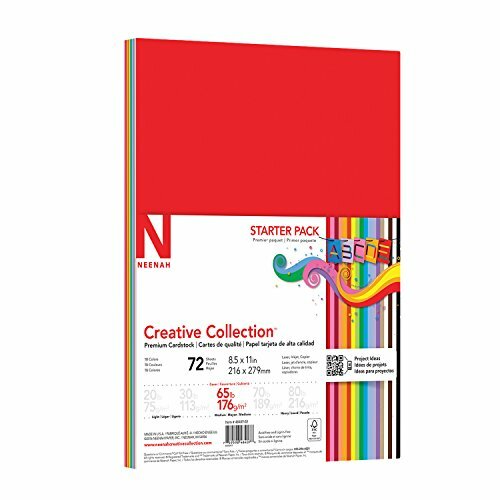 Papers that bring out the creativity in everyone, from colorful schoolroom projects to scrapbooks to collages, papers that deliver personality as well as performance. Papers you can depend on to make your projects shine. Papers designed to handle embossing, stamping, folding, hole punching, printing ? whatever your creative whims desire. Whatever your creative vision, the papers in this collection can help you express it. Your muse will be impressed. Acid-free and lignin-free for non-yellowing, archival-quality projects. 4 Sheets each of Royal Blue, Colonial Blue, Lilac, Concord Grape, Wisteria, Bubble Gum, Old Town Red, Re-Entry Red, Orbit Orange, Galaxy Gold, Goldenrod, Martian Green, Gamma Green, Kraft, Natural, Clove, White, and Eclipse Black. If you have any questions about this product by Neenah, contact us by completing and submitting the form below. If you are looking for a specif part number, please include it with your message. BalanceFrom Puzzle Exercise Mat with EVA Foam Interlocking Tiles, Black, 144 sq. ft.